New York City's Broadway Theater Reviews & Listings: Broadway Circle. Broadway Plays & NYC Musicals. 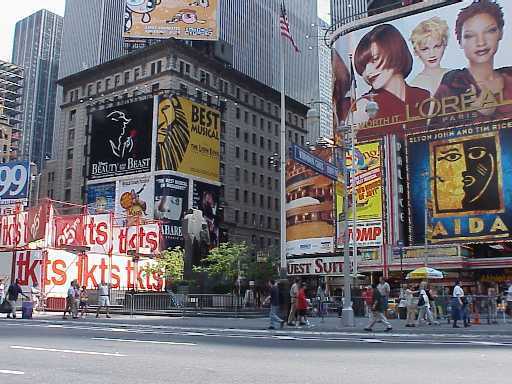 NYC Broadway Theatre: Times Square pictures, photos, & Broadway tickets. Broadway shows now playing on Broadway, New York City Broadway Plays : Jersey Boys, Journey's End, Legally Blonde, Les Miserables, Lion King, LoveMusik, Mamma Mia, Mary Poppins. Virginia Theatre, Tickets 245 West 52nd Street between Broadway and 8th Avenue; Tue 7 PM; Wed-Sat 8 PM; Wed, Sat 2 PM; Sun 3 PM; 2 Hours 15 Minutes; 1, 15 Minute Intermission; Dodger Theatricals, Joseph J. Grano, Tamara, and Kevin Kinsella present this new musical by Marshall Brickman and Rick Elice. Music and Lyrics: Bob Gaudio & Bob Crewe; Director: Des McAnuff; The story of the rock-n-roll hall of famers "The Four Seasons". Belasco Theatre, Tickets 111 West 44th between Broadway and 6th Ave; $36-$96; Tue-Sat 8 PM; Wed, Sat, Sun 3 PM; Boyett Ostar Productions presents R.C. Sherriff's acclaimed drama inspired by a true story of friendship and survival during World War I. Director: David Grindley. Palace Theatre, 1564 Broadway at Times Square; 212-307-4100; Hal Luftig, Fox Theatricals, and Dori Berinstein present this musical based on the novel of the same name by Amanda Brown and the MGM Movie. Sorority Star does not take "No" for an answer and sets off for Harvard Law. Book: Heather Hach; Music & Lyrics: Nell Benjamin & Lawrence O'Keefe; Director/Choreo: Jerry Mitchell; Settings: David Rockwell; Costumes: Gregg Barnes; Lighting: Kenneth Posner; Sound: ACME Sound Partners; Musical Director: Alex Lacamoire. Broadhurst Theatre, Tickets 235 West 44th Street Between Broadway and Eighth Avenue. Cameron Mackintosh presents the 1985 musical by Victor Hugo for a 6 month engagement. Libretto: Alan Boublil and Claude-Michel Schonberg; Translation: Herbert Kretzmer and James Fenton; Music: Claude-Michel Schonberg; Director: John Caird; Settings: John Napier; Costumes: Andreane Neofitou; Lighting: David Hersey; Sound: Andrew Bruce. Minskoff Theatre, 214 W. 42nd. St. Between 7th and 8th Ave. 212-307-4747; $30-$100. 2 hrs. 45 min. One intermission. Director Julie Taymor. TONY Award winning musical of the 1994 film of the same name. Disney's new theater adaptation from animated screen. Cast of 46 sings the Elton John - Tim Rice score. Simba the lion cub destined to become king. Garth Fagan - Choreographer. Biltmore Theatre, Tickets 261 W. 47th St. Between 8th and Broadway; $76-$101. Tue-Sat 8 PM; Wed, Sat, Sun 2 PM; Manhattan Theatre Club presents this romantic musical about a German composer and his lusty Viennese showgirl spanning 25 years through Paris, Berlin, Hollywood, and Broadway. Book: Alfred Uhry; Music: Kurt Weill; Director: Harold Prince; Director: Lynne Meadow. Winter Garden Theatre, Tickets 1634 Broadway at 50th Street. $56-$100. Wed-Sat 8 PM; Wed, Sat 2 PM; Sun 2, 7 PM; 2 hours 30 minutes; One Intermission; Mamma Mia opened at London's Prince Edward Theatre in April, 1999 and was a fantastic hit that has broken every known British box office record and continues to sell out. The group ABBA has sold over 350 million records worldwide. Mamma Mia includes the hit "Money, Money, Money". A musical love story based on the music of ABBA. Produced by Judy Craymer, Richard East & Bjorn Ulvaeus for Littlestar in association with Universal. Music-Lyrics by Benny Andersson and Bjorn Ulvaeus. Playwright Catherine Johnson. Director Phyllida Lloyd. Choreographer Anthony Van Laast. New Amsterdam Theatre, 214 W. 42nd. St. Between 7th and 8th Ave. 212-307-4747; Disney Theatrical Productions and Cameron Mackintosh will present the new musical based on the writings of P L Travers and the 1964 Walt Disney film, which features a book by Julian Fellowes, original songs by Richard M Sherman and Robert B Sherman, and more music and lyrics by George Stiles and Anthony Drewe. Director: Richard Eyre; Co-Director & Choreographer: Co-Choreographer: Stephen Mear; Matthew Bourne; Orchestra: William David Brohn; Settings and Costumes: Bob Crowley; Lighting: Howard Harrison; Sound: Andrew Bruce.